Adobe Premiere Elements VS Adobe Premiere Pro CC: Which one should I use? Anyone who chooses to use an Adobe's video editing software regardless of the experience level can hardly make a mistake. However, Adobe offers different editing programs so before choosing to buy one or the other it is necessary to know what the software can and cannot do. Both Premiere Pro CC and Premiere Elements are among the best editing software currently available, but in entirely different categories, since Premiere Pro is best suited for professional video editors while Premiere Elements is designed for consumer-level users. Let's take a look at the advantages and disadvantages of both of these programs and help you reach the decision which software you should use. If you are looking for a professional and easy to use video editor, you should try Wondershare FilmoraPro. It is the first editor you should consider if you want to enter a new video editing level and own advanced editing skills easily. FilmoraPro supports basic editing features, including slipping and cutting. It also supports advanced features: audio sync, text/video animaiton, various effets and more. The cool part is the worktable is customizable. It is free to use and download it to have a try now! Each of these video editing programs has been around for decades and they both have a well-earned spot on the list of the best video editing programs ever created. A closer look at the similarities and differences between these two programs will provide you with a better insight into what you can expect from Adobe's much-famed video editing software. 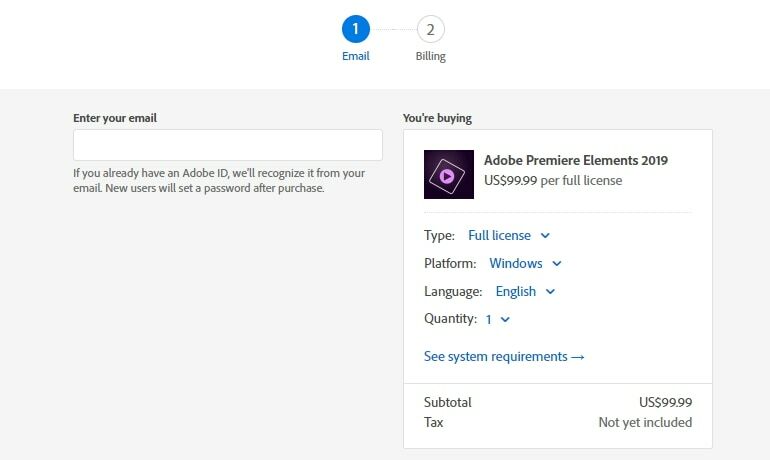 The fee you have to pay for using Adobe's editing suite can be a determining factor that helps you to reach the decision whether to purchase the Premiere Elements 2019 software or Premiere Pro CC. Premiere Elements is currently available for $99.99, while you can also purchase a suite that contains both Premiere and Photoshop Elements for $149.99, which can be a great choice considering the fact that once you purchased the suite you don't have to pay for monthly or annual subscriptions. On the other hand, Premiere Pro CC is now only available through annual subscriptions to Adobe Creative Cloud. The lowest monthly subscription is $20.99 for just Premiere Pro CC, while if you want a full Adobe package you'll need to pay $52.99 per month. With the annual cost of approximately $599.88, Premiere Pro CC certainly isn't the cheapest editing software available, but purchasing this video editing software can be considered a long-term investment for professionals who aim to earn their living with it. Both Premiere Elements 2019 and Pro CC can be used with Mac and PC operating systems. However, Premiere Pro CC isn't compatible with Mac OS versions older than Mac OS 10.10 or Windows OS versions older than Windows 7. Furthermore, you'll need at least 8GB of free hard-disc space and 8GB of RAM, although 16 GB is recommended, as well as a Multicore Intel Processor with 64-bit support if you would like to use Premiere Pro on your Mac or PC. You'll also need a sound card compatible with Microsoft Windows Driver Model for PC or a sound card compatible with Apple Core Audio if you'd like to use this editing software on a Mac. Click here to check a full system requirement. Premiere Elements requires just 4GB of RAM and 5GB of free hard-disc space, both on Mac and PC. Like the Pro, Elements 2019 works only with versions of Windows 7 and later as well as Mac OS 10.10 or later. In order to run Premiere Elements on a PC, you'll need at least a 2 GHz processor that supports SSE2, although the Intel Core i7 processor is required for processing of XAVC-S files. 64-bit Multicore Intel Processor is necessary if you are considering using this software on a Mac. The minimum screen resolution required for Premiere Elements to run properly is 1024x768, which is slightly lower than the minimal screen resolution, 1280X800, demanded by the Pro CC. With each new update in the last 28 years Adobe has improved Premiere editing software. As a result of an effort that took more than two and a half decades, Premiere Pro CC has an easy to use interface. 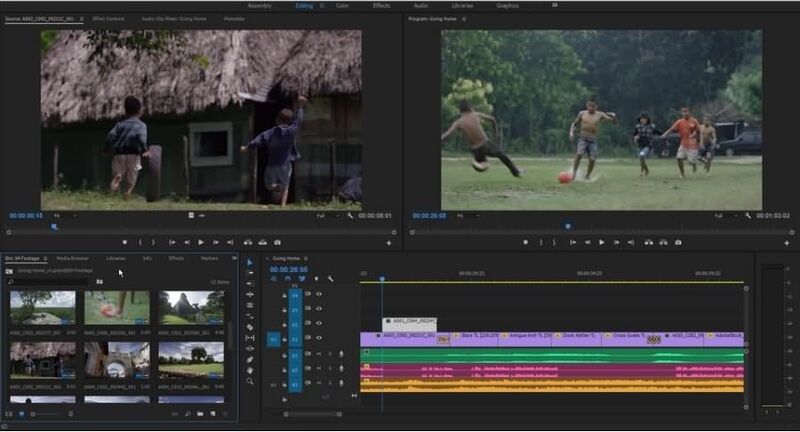 Both Premiere Pro CC and Premiere Elements editing software enable you to use as many audio and video tracks as your project may require, although adding tracks to the timeline in Premiere Elements 2019 is only possible from the Expert mode. Accessing visual effects and editing tools is as simple as it can be since each software has neatly organized toolbars and menus. Mac users may find Premiere Pro CC's layout a bit out of touch with Mac's usual look and feel, but this doesn't diminish the software's high level of functionality. Probably the greatest change on Premiere Pro CC 2019 is the addition of the Add Captions feature and VR, since adding captions is now finally available in the latest version of the Premiere Pro CC. Premiere Elements can be viewed in Guided, Quick and Expert modes, which is a great advantage for users how are just learning how to edit or need to complete their editing tasks as fast as they can. Learning how to use Premiere Elements may take some time, but the software itself makes this process as easy and as fast as it can possibly be. When it comes to features and the overall capability of the software Premiere Pro clearly has the upper hand, since it supports a larger number of video formats and it enables users to import footage from literally any device that can capture any kind of footage. Adding sound effects, visual effects or creating titles in Premiere Pro CC is perhaps the most professional way in which you can approach these tasks, although you may also need a professional level of video editing knowledge to properly apply effects or create titles. Premiere Elements 2019 may not be as powerful video editing software as Premiere Pro CC, but it still provides support for AVCHD, Blu-Ray, H.264 and many other video formats, and it enables you to create polished videos almost effortlessly. The 'Haze Removal' feature can be used to remove fog or smog from the videos and increase the levels of sharpness as well as the vibrancy of the colors. Part 2: Adobe Premiere Elements VS Adobe Premiere Pro CC: Which version should I use? Although you can hardly make a mistake by choosing any of these two video editing programs, you should make your choice in accordance with your needs and the level of experience. If video editing seems attractive to you, but you still don't have the necessary skill and knowledge to use the professional editing software, then Adobe Premiere Elements 2019 is the best choice you can make. The Guided Mode will help you learn how to combine video clips, trim them or apply visual and audio effects. This video editing software is also a great choice for all users who simply need to produce videos on a consumer level. The Premiere Elements enables you to work with a number of different video file formats and you can easily upload your videos to social networks or video sharing sites directly from the software. Working with footage captured with professional video cameras may require a video editing software that is compatible with the video file formats produced by high-end cameras. Adobe Premiere Pro CC supports almost all, if not all video file formats, which is a strong reason to use this software during the editing process. Furthermore, if you plan on distributing your films and videos to film festivals, TV stations or cinemas Adobe Premiere Pro is the right editing software for you. The software may require extensive knowledge of video editing, but experienced video editors will certainly enjoy using this powerful editing software that can easily create breathtaking visual content of the highest standard. Adobe Premiere Elements is a beginner level video editor that uers can make videos quickly with limited functionalities, while Adobe Premiere Pro offers more editing tools that you can make powerful videos if you are an advanced video editor. Choosing the right video editing software can be a tantalizing task because no one knows your needs better than you. However, if you are looking for an affordable software that can perform all the consumer level editing tasks Adobe Premiere Elements 2019 is the right choice because if you opt for a more professional option you will end up with a pricey editing software whose best features you don't really use. Professional video editors in need of a reliable software that can perform the most demanding tasks shouldn't hesitate to purchase the Adobe Premiere Pro CC because it is worth every cent they will invest. If still don't know which one to choose, why not choose Wondershare FilmoraPro? It is a professional video editing software that can power up your story. It is easy to use compared with Premiere. Auto color correction and automatic audio sync can help you save a lot of time. It is designed for pros or semi-pros. Download Wondershare FilmoraPro now (FREE)!